Ceva Animal Health is working with shelters, volunteers and veterinary hospitals across Texas and Louisiana to support the needs of animals left homeless by recent flooding. And the team is staging product in the southeast in preparation for Hurricane Irma’s landfall. 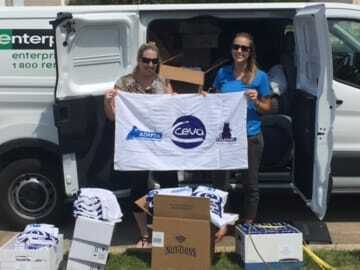 Ceva has sent thousands of doses of parasiticides, dermatology products and calming pheromones to help volunteers caring for animals lost or left behind by families fleeing the recent storms. These products are available for shelters and clinics caring for strayed or abandoned animals. The company is also sending donations to organizations sheltering people and their pets. And the company is looking to do more. The company will provide pheromone products Feliway® and Adaptil® to help calm cats and dogs during transportation and the period of time when they adjust to their new surroundings. Ceva will also provide free doses of the Vectra® 3D for Dogs parasiticide to shelters receiving dogs testing positive for heartworm disease. The offer applies to shelters in the flood zone as well as shelters located elsewhere which are receiving dogs to reduce the strain on Texas, Louisiana and Florida shelters. Following Hurricane Katrina, rates of heartworm disease infection began to climb when infected dogs were sent to shelters across the country. While this eased the strain on shelters caring for thousands of displaced animals, in many cases it shifted the front lines of fighting the disease from the Gulf region to shelters and veterinary clinics in regions where heartworm disease had not been observed before or had only been noted in low levels. New data shows using Vectra® 3D for dogs to kill and repel mosquitoes along with a macrocyclic lactone preventive as part of a multi-modal or double defense approach, is more effective than using the macrocyclic lactone alone to prevent heartworm infection. Shelters in need of supplies should contact their Ceva representative or email basic information about their needs and current situation to usa.communications@ceva.com or call 1.800.999.0297. To learn more about a double defense approach to fight the spread of heartworm disease visit: FightHeartwormNow.com.